I published this essay last spring on an earlier version of this blog. It is reposted here because it makes sense in the context of big, bold reforms to government spending. While many government functions fill important needs in people’s lives, some of those functions are more important than others. It is essential to protect those functions from the booms and busts of the business cycle. The need to protect those programs is further elevated under a balanced-budget amendment: in recessions when tax revenue is tight, limited borrowing capacity leads to tough priorities - or sequester-style across-the-board spending cuts. Social Security is of major importance, not just to Democrats in Congress, but to Republicans as well as millions of Americans whose daily livelihood depend on the program. It has, over time, become as essential to our nation as defense spending. Thanks to its independent funding mechanism, it is to some degree shielded from the annual swings in Congressional fiscal policy. This does not mean the program is solvent for the foreseeable future – quite the contrary – but there is a great deal of common sense to the basic idea of an independent funding arm for the program. Defense spending, again, is also essential. Given the major role that the U.S. armed forces play not just for our nation, but globally, it is important to secure its funding for the future. Specifically, Congress should develop a funding model that protects the Department of Defense from disruptive, sequester-driven cuts. One way to make defense spending immune to sequester cuts is to develop a funding model mimicking Social Security. Tax revenue can be guaranteed by a dedicated Defense Tax. Since 80 percent of federal tax revenue comes from taxes on personal income, it is reasonable to carve out a share of those tax revenues and dedicate them as a tax specifically set aside for national defense. The tax could consist of the first dollars of a person’s federal tax liability. For example, if a person owes $2,000 federal income taxes, and the Defense Tax would be 20 percent of a person’s federal tax liability, then the first $400 that the taxpayer pays for that year would go unabridged to funding national defense. Once the Defense Tax was paid, the rest of the personal income tax revenue would go toward general-fund expenditures. The share going to the Defense Tax would vary based on a mechanism described in Equation 1 below. Reasonably, the Defense Tax should be governed by no other factor than the global geo-political and other factors taken into account when Congress determines the defense budget. Ideally, this would require a forecasting mechanism to provide Congress with a formula for setting the Defense Tax. However, the past quarter century has proven that such forecasting is very difficult. The end of the Cold War and the collapse of the Soviet Union and its satellite states redrew the global map in more ways than one. The 9/11 attacks led to a fundamental transformation of the Middle East, with repercussions as far away as Tunisia and Africa’s Horn. In the past few years, the economic and political erosion of the European Union has led to instability, uncertainty and shifting political alliances on a continent often regarded as the epitome of political, social and economic stability. where TD is the total revenue from the Defense Tax in one year, the numerator is the sum total of annual defense spending over the past five years, and M is a mark-up coefficient. Equation 1 thus determines the current-year Defense Tax as the average of defense spending over the past five years, multiplied by a mark-up. The mark-up is important. It brings past spending up to current levels in terms of inflation and technological progress. It means, simply, that this year’s Defense Tax will be 20 percent higher than the average for the past five years. By tying the Defense Tax to past defense spending in this manner, Congress takes a big step toward independence in the funding of national defense. There is just one more step needed. Equation 1 provides stability and progress in defense funding, but it does not in itself allow for contingencies that require rapid increases in defense spending. The response to the 9/11 attacks would not have been possible without extraordinary appropriations; if Congress must rely on such mechanisms in times of rising international tensions or conflicts, then defense funding will eventually be put alongside other budget items. That defeats the purpose of the Defense Tax. Sources: Bureau of Economic Analysis (personal income) and Office of Management and Budget (defense spending). 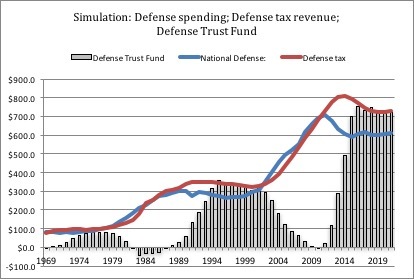 The build-up of defense spending under the Reagan administration would have tapped into the Defense Trust Fund for several years, even led to a complete depletion of the fund. This has to do with the starting point: in this simulation the fund had not existed very long at that point. A similar depletion episode after 9/11 allows for a doubling of defense spending over a decade. 3. The availability of the Defense Trust Fund allows Congress to focus on the necessary defense build-up without getting caught up in a political battle over tax policy in times of global uncertainty. The construction of the Defense Tax also has a balancing mechanism. When a period of global tensions is over and defense spending flattens, or even decreases, the tax does the same in a lagged fashion similar to its increase. This prevents excessive build-up of the Defense Trust Fund; as the historic account above indicates, the money stored away in the fund will be enough to allow for the reserve needed in times of national uncertainty.